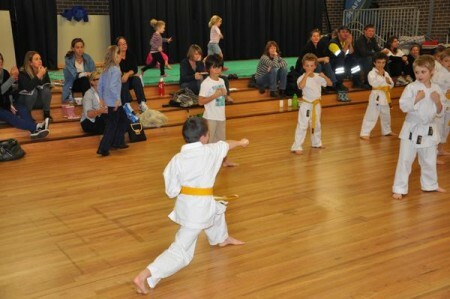 Home » Blog » Should Parents Be Allowed to Observe Kids Martial Arts Classes? Should Parents Be Allowed to Observe Kids Martial Arts Classes? A child performs karate moves under the watchful eye of his parents. In the “old school” it was considered poor practise to allow parents to observe their children doing their martial arts classes. Were they hiding something, or was there a reason for this policy? A lot has changed, with parents now encouraged to watch and sometimes take part in the running of classes. What are the pros and cons of parents being allowed to watch the classes? First, let’s explore the arguments in favour of allowing parents to watch the classes. There are many. It is the parent’s right to see what goes on in the classes. The parents are paying for them, and they need to see if they are getting value for money. They need to see if their child is getting anything out of the classes. There is a lot of competition for their dollar in the current martial arts world, and there is a good chance another school will be a better choice if they have enrolled their child in a poor school. It is better for the kids if they are watching. Parents will remember important announcements or pick up newsletters. Kids will forget them. Parents can give the kids feedback if the child does not seem to be getting something, as they can often see things the child may not see themselves. In addition, parents can give the instructor feedback if the child is having trouble doing something. They will do their best to impress you. They’ll take a greater interest in class if mom and dad is watching, and especially if they are encouraging the child. They will take more pride in their achievements, and will be more likely to practise outside of class. Parents might even be called upon to help with a class by holding kick bags or focus mitts, or managing a game. Kids love it when their parents get involved. It shows support for the school and the child. There have been numerous cases of child abuse over the years involving karate instructors. Would this have happened if the parents had been more involved in the classes and was allowed to observe them at all times? I suspect the answer would be “no”. Now, the arguments in favour of not allowing the parent to watch their children in martial arts classes. There are also many here. I’ve had many parents remove themselves from the classes, complaining the children become too self-conscious if they are watching them in the classes. I suspect this arises as the child tries too hard to meet their parent’s approval. In some cases the child constantly checks to see if mom or dad is watching. This may also stem from trying to meet the parent’s approval. Parents create a disturbance by loud chatting or phone conversations. This happens a lot, and is one reason many are asked to leave the hall. In other cases, siblings are not managed properly and create a disturbance, interrupting the class. Please see another post about this subject. Parents loudly giving instruction to their children. In extreme cases I have seen parents, usually fathers, loudly correcting their children, sometimes in a foreign language. Not only is this disruptive to the class (in any language), it makes the child feel self-conscious and singled out. If a parent with a big ego sees other children progressing faster than their own they will have the tendency to accuse the sensei of favoritism, poor teaching, or other forms of incompetence. At that point, they feel they can withdraw their child from the program without any sense of guilt. In less extreme cases, the child will be made to feel they can never measure up, but will feel like quitting themselves. There are many pros and cons on this issue. Perhaps the solution is to allow the parents to watch from an enclosed area with windows so they can see the classes, but not be a distraction. This would not always be practical, however. In any case, it is important for parents to support their children in their martial arts journey. I have written a separate blog post about this, which you might find interesting. I think it’s most useful, in most cases, to allow parents to watch. Your points about hearing announcements & protecting the kids from potential abuse are very strong reasons. There are cases I’ve encountered, though, where the kid can’t focus or the parent can’t stop coaching their kid. We have definitely had to suggest going for a coffee to a few parents. After a few weeks the parent can start watching again, once both have adjusted to the idea of separating during class. Ultimately, I think it’s a case-by-case thing. That’s the beauty of martial arts training: each child is treated uniquely, to address their individual needs. Thanks Caitlin and welcome here! It sounds as though you have had similar experiences to me in running classes. It is difficult to get the coaching to stop, and I wonder if the child is getting too much pressure at home as well. Appreciate your comment. For me and my son I think its a very good thing, I love watching him do karate and I observe what goes on in the whole class, my son loves me watching him any I don’t think it takes away from his focus, I think it adds to it, however I have observed that many other parents don’t watch, they just sit there and pass time until it’s over, often passing time means talking to another parent next to them for the whole class! and doing it loudly, giggling, gossiping or sitting there one upping each other with their stories and doing my head in, I find it disrespectful, and feel it is a very bad example for all the children, I wonder what their own kids think when they look over and they are gas bagging, those parents, should not watch. Thanks Rob for your insights! I’ve had a few parents tell me I should be harder on some of the other parents watching for the reasons you describe. It is a fine line we walk between offending someone and looking out for the good of the class. And you are correct, it shows disrespect. I am glad it works for you and your son. Back in the day it was considered disrespectful unless the observer had an active role in the class or they were showing sincere interest in joining the school. When I was learning Karate, it was the same. Mum dropped me off, picked me up after, and I progressed leaps and bounds. Mostly because there was no real seating area other than the option to sit on the ground off to the edge of the mat, where the next class was waiting… But this was because of the constraint on the space but it worked well. I do remember a case where one of the parents stepped up to the mat to spur on his son while sparring, but Sensei promptly ceased the match, ceremonially bowed to the shrine & the class as he stepped off the mat, then led the man out of the classroom before coming back and restarting the sparring match. I could see the love of the art in him, and the calm “We do things by order and honour here” approach he no doubt instilled in that parent. I’m all for parents watching, especially if it were my little girl under the tutelage of some instructor I’ve never met before, but if it was a small Japanese man like my sensei before me, I’d probably drop the kids and back away slowly. Love the story about the calm sensei! It seems that times have changed, for the most part. Thanks for commenting Tommy. I think it is fine for parents to watch as long as there is a proper place for them to sit where they are out of the way. However, I do think there should be some rules that they obey and should be informed of such as no loud talking or laughing, no communication with their child while on the mats, no interfering with lessons at all, mobile phones on silent, no young siblings, no eating or drinking in the hall etc etc. Basically just good manners! Hi Sue! Yes, it is important that parents are not sitting at a place where they can be distracting, like the front of a class. Perhaps your rule suggestions can be incorporated into our “Welcome letter”, great idea! Thanks for your insights! It would have cut down considerably on the number of cases June, if parents had been more involved. Sad but true. Thanks for your insights. The sensei is gratified that it has impacted your life in such a way Maki. Thanks for your feedback!